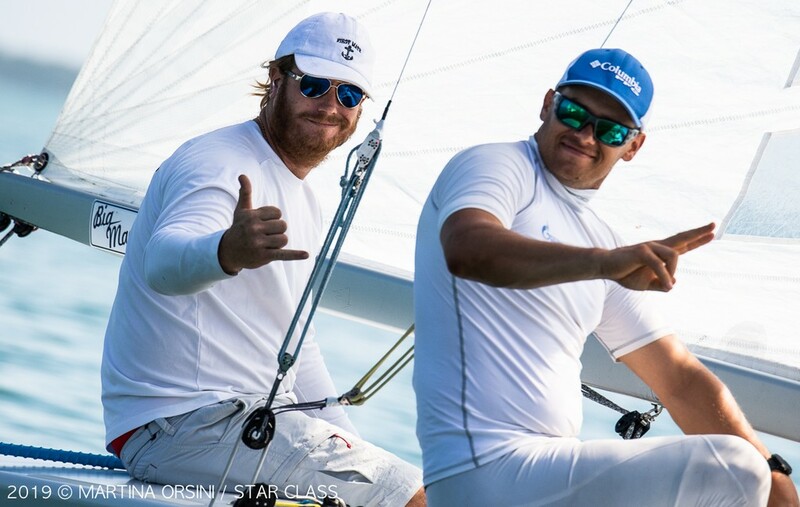 The 36 teams attending the inaugural Star Junior World Championship at Coral Reef YC in Miami, USA, meet similar conditions to the Olympic classes who had just vacated Biscayne Bay. The wind blowing around 6-8 knots from West at the start at 12,10 pm and then dropping to 4-5 knots towards the end of the race one hour and 15 minutes later. It was American Star sailor Luke Lawrence, with crew Alexey Selivanov, who took an early lead at the first windward mark and kept gaining on the way down to the gate and through to the finish. Behind them, the Italian Laser Radial Youth World Champion, Guido Gallinaro with German Star World Champion crew Firthjof Kleen fought for second against Irish brothers Robert and Peter O’Leary – in the unusual setting with Robert at the helm. British Laser sailor Lorenzo Chiavarini with Brian Fatih (USA) crewing finished 17th. Racing is scheduled to start one hour earlier (at 11am EST) to try to get three races done and get back on track with the program.